Trump is not in it to win it. Pundits will argue that he sure as hell is in it to win it and it looks like he will, dammit. Others will say that his unorthodoxy is part of what makes him the brilliant tactician that he is; that by making outrageous and seemingly offensive statements he is breaking the mold of the consummate politician thereby owning this election. Another segment of the population is so offended by him and his Hitler-esque ideology (their words, not mine) that they’re predicting we’ll soon be goose stepping our way through a totalitarian dictatorship. Still some, like me, just think he’s crazy. Do you really think Trump wants to make America great again? Or is it something else? When a guy’s got his name on more buildings than Sam Walton, it can’t be the fame. Power hungry? I get that, but there are other ways to be powerful without having to hoodwink the electorate all the way into the White House. I know, Ronald Reagan was an outlier, too but who are we kidding: Trump is no Ronald Reagan. This isn’t my first assessment of the ruse of the century. 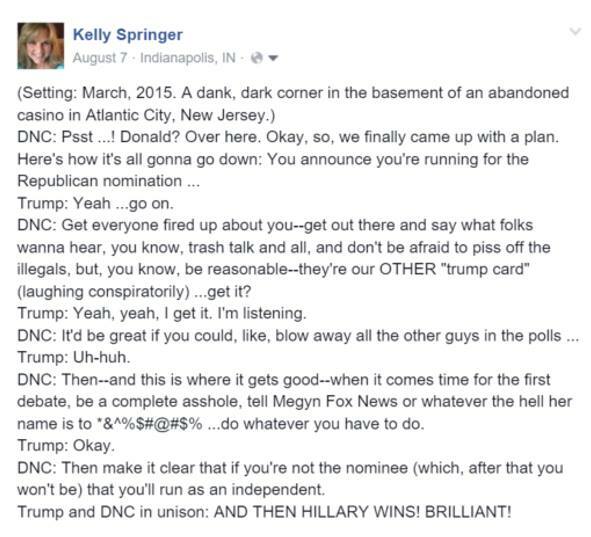 In early August, and after Trump had announced his candidacy, I posted this vignette on Facebook. At this point, I’m not sure that this is exactly his motive, but I do think he has some O’Henry trick up his sleeve, you know, the surprise ending. Because come on, you threaten to boycott a debate because you don’t like Megyn Kelly? Really, Donald, if you can’t get along with the host of a cable news show, how are you going to navigate Putin? Whining that you’re not coming to the party if Megyn is there rather emasculates you, don’t you think? At the very least you sound like a petulant child who is picking up his toys and going home. His behavior is not logical, which is why some in the political sphere, like Rush Limbaugh, believe this is all part of his strategy. To me, though, it appears as if he is setting himself up to be so reviled that he’ll either step aside and let someone else occupy his spot, or he really is a DNC plant. Regardless, I both cringe and shake my head every time the guy opens his mouth, wondering what manner of cartoon character rhetoric is going to come out. Would I keel and wail and render my flesh if he manages to get elected? No. Furthermore, I don’t think that’s going to happen. This guy is too smart to resort to acting like an asshat, and he’s wily enough to fool people into thinking that he is. If that circular logic baffles you, then guess what? You’ve been Trumped.